Ronon once again comes face-to-face with Tyre, one of his people who became a Wraith worshiper -- but who now claims he has broken free of their influence. Collecting plant stuffs, Ronon Dex and Teyla Emmagan stroll though a wooded area. They chuckle over Kanaan’s transition to living in Atlantis. Ronon spots a body in a clearing and, as he approaches it, he is ambushed and shot three times with a Wraith stunner. As he collapses, Teyla sees the attacker: Ronon’s former friend and fellow Satedan, Tyre (“Reunion”). Tyre also stuns Teyla, but leaves her on the planet when he takes Ronon. She returns to Atlantis to report Ronon’s kidnapping. Unable to track Ronon, Lt. Colonel John Sheppard presumes Tyre wanted Ronon alive. To try and find a lead on Tyre, John suggests that they ask another Satedan, Solen Sincha, who Teyla and Ronon encountered on the planet Belkan two years ago (“Trinity”). Ready to roll, Sheppard heads for the door. But Mr. Richard Woolsey, Atlantis’s new commander, clears his throat … reminding Sheppard of protocol. Once Sheppard asks for permission, the team starts off again, but Woolsey stops them. Teyla has not formally petitioned to rejoin the team. Surprised, Sheppard allows her to decide after they talk to Sincha. The drunken Sincha is still on Belkan. He has with no love for the Wraith-worshiping Tyre, who the Satedans despise and the Wraith have apparently abandoned after he failed to deliver Ronon and the team a year ago. Sincha agrees to pass along any information he might hear on Ronon. When Tyre begs to be subjected to the euphoric process, reminding the Wraith that he had promised to reinstate their former arrangement if he handed over Ronon, the Wraith flings him against the wall, having no further need of Tyre. While waiting for intel, Teyla discusses with Woolsey her dilemma about returning to work. She wishes to continue the fight against the Wraith, but doesn’t wish to risk leaving her newborn son without a mother. Woolsey confides that he can sympathize, having had only a Yorkie he loved and lost in a divorce. After a sleepless night spent searching for a fresh perspective on how to find Ronon, McKay goes to the mess hall where he finds Sheppard. As they go over the details again, Major Lorne comes in with new intel from Sincha. Ronon and Tyre are on Sarif Sur. Searching the planet, Lorne’s team locates the barely alive Tyre. 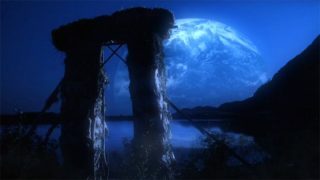 He is taken to the Atlantis infirmary, where Dr. Jennifer Keller finds that reverse-feeding leaves behind a Wraith enzyme which produces a euphoric state. Withdrawal is similar to withdrawal from any addictive substance. Tyre is moved to an isolation room where he is strapped to a bed, writhing and screaming through the slow and painful withdrawal. Sheppard refuses to allow any sedatives which might slow his recovery. Teyla learns of Tyre’s capture, and angrily confronts Sheppard about not including her in the mission. Sheppard tells her she must decide now if she wants to return to his team — he can’t give her the option every time a mission comes up. Still vacillating, Teyla turns to Kanaan. He repeats what Sheppard told her when she was pregnant: In rejoining the team, she makes the future safe not only for Torren, but all children. As Tyre detoxes, Ronon screams with a similar agony as he is repeatedly subjected to the reverse-feeding process by the Wraith. While Tyre regains his sanity an his freedom, Ronon slips further away, enthralled by his new Wraith master. When Tyre is finally clean, he tells Sheppard that he knows where Ronon is. He asks to accompany the rescue team. Woolsey is against this, but Sheppard knows what it is to be desperate to save a buddy. Reluctantly, Woolsey agrees, but he wants Lorne’s team to go along. Teyla overhears as she and Torren are going to meet Kanaan in the cafeteria, and she hands off the baby to Woolsey and goes to suit up. Tyre leads the team to a Wraith laboratory. He shows them where to plant C4 explosives in the power relay chamber, so that the facility can be destroyed with the flick of a switch. When they locate Ronon, he defends the Wraith who has converted him. Ronon, the one man who hated the Wraith more than anyone in the Pegasus Galaxy, has been turned. He has sworn his allegiance to the Wraith, and sworn death to their enemies — Atlantis. Tyre grabs Teyla from behind, threatening her life if anyone resists capture. He, too, appears to still be a Wraith-worshiper — or he is playing both sides. Before they are taken to holding cells, Ronon punches Sheppard in the face. After Tyre and Ronon convince the Wraith that Sheppard, in particular, is worth more converted than dead, Tyre removes Sheppard from his cell for a first session. When the Wraith reaches out to feed on Sheppard, Tyre draws his sword and cuts off the creature’s hand. Sheppard quickly shoots the Wraith and holds off others as Ronon and Tyre fight one another. Freed earlier by Tyre, who is still on their side, Teyla and McKay free Lorne’s team and arrive on the scene. Ronon has gained the upper hand on Tyre and is beating him to a pulp, but Teyla stuns Ronon — again, he has to be shot three times with a stunner before he finally collapses. Lorne’s team is quickly overwhelmed by Wraith. Threatening to destroy the facility with the hidden explosives, Tyre is able to buy everyone’s freedom. The Wraith allows them to leave. When they are all safely in the Jumper, Tyre detonates the C4, obliterating the research lab, killing the Wraith, and sacrificing himself in a final Satedan act of redemption. Back in the Atlantis infirmary, Ronon endures the same painful detox that Tyre went through. He tries to convince Sheppard that he isn’t a threat to them, and screams for Sheppard to either kill him or set him free. Teyla officially decides to rejoin Sheppard’s team. She visits Woolsey’s quarters to officially request reinstatement, where she finds that he has changed from his Atlantis uniform into a regular suit and tie — something “more comfortable.” Ready to relax as well, Teyla heads to her quarters where she and Kanaan cuddle Torren. Ronon’s team mates take turns sitting with him until he is finally free of the Wraith enzyme, and their brainwashing. Sheppard tells him of Tyre’s honorable death, and leaves Tyre’s sword at Ronon’s side. Ronon, understanding Tyre now, lays the sword across his chest and grieves. “Joe had lots to say about Friday’s episode, entitled ‘Broken Ties,’ a Ronon-centric episode that he wrote and produced. Firstly, he told me that Jason Momoa, who plays Ronon, gave a great performance. 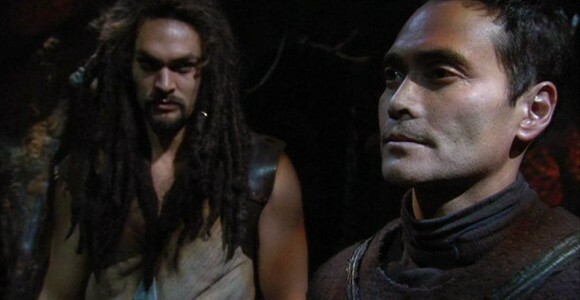 He showed a wide range of emotions, and allowed us to see Ronon at his lowest point, displaying a vulnerability not often shown by actors who play tough guy roles. It takes guts and talent, and this guy has both. “Mark Dacascos returns to reprise his role as Tyre, and, as Joe explained, Mark is the crew’s all time favourite guest star. ‘Why?’ you might ask. Because he’s so darn nice, that’s why! And I concur, as I have met him myself — he really is a gentleman. “Joe also mentioned that this is a great episode for stunts. James ‘Bam Bam’ Bamford, our stunt coordinator and stuntman extraordinaire, has always wanted to do an extended sword fight, and he finally gets the opportunity to do just that in this episode. Now, unfortunately, the sword fight was edited down considerably for the episode to tighten it up and make it great, but for those of you sword fight enthusiasts, I understand Ivon Bartok will be including the entire sword fight in a behind the scenes featurette that will be on the Season Five DVDs. So that’s something to look forward to. VOTE! How would you rate Atlantis's "Broken Ties?"